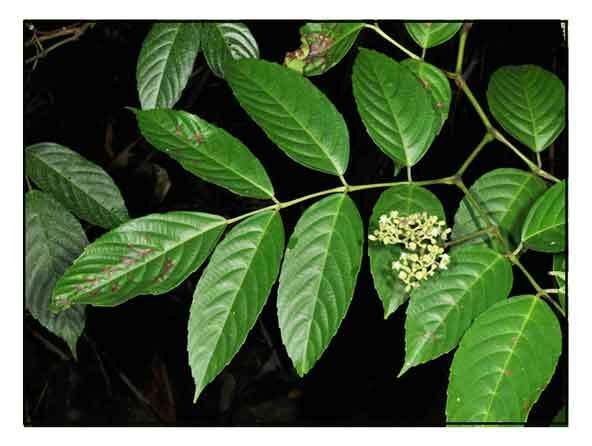 Quisumbing's compilation lists three species under the Genus Leea: Leea aculeata (mali-mali), Leea indica (mali), and Leea manillensis (abang-abang). BORNEO: Bundong, Denigirut, Kenyupiang, Kruang, Mali-mali beduri, Mali-mali bini, Njebo. Mali-mali is a shrub or small tree reaching a height of 8 meters. Stems are spiny. Leaves are smooth and trifoliate or pinnate. Leaflets are oblong to subelliptic, up to 15 centimeters in length or more, 3 to 4 centimeters in width, the terminal leaflet being larger, prominently toothed along all margins except the base, pointed at the tip, blunt at the base. Flowers are white, and borne on corymbs 5 to 8 centimeters long. Fruit is red, somewhat rounded, about 1 centimeter in diameter. - Common in thickets and secondary forests, especially along streams at low and medium altitudes, from the Babuyan Islands and northern Luzon to Mindanao and Palawan, in most or all provinces. - Also occurs in Borneo, Java, Celebes, New Guinea, and the Moluccas. - Leaves are reported to be used for purifying the blood.